We want all our beautiful children to reach their potential – but sadly one in four children don’t get a fair go in New Zealand. 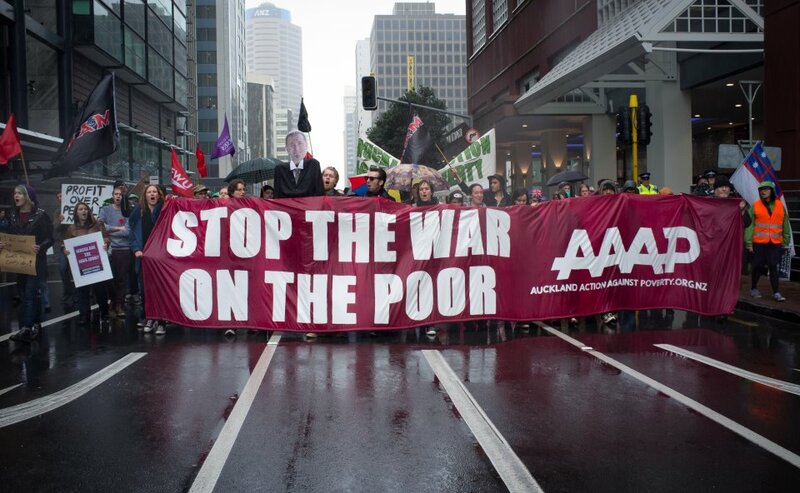 Child Poverty Action Group is calling on people and organisations across Auckland to join a march from Britomart to Aotea Square to demand action on child poverty in Aotearoa. We’ve invited politicians from across the political spectrum to attend the march. We’re looking for a firm indication from political leaders that they are committed to the steps needed to give all children a fair go so they can reach their potential. We aim for this to be a really colourful, child-friendly event – we’d love to bring people together from all sections in our society to show the nation how much we care about our children and their well-being. The main thing now is to get as many people along as possible and we could really use your help! admin if you’d like to order printed copies. This Government manipulates statistics to show how well the economy is doing and most of us swallow it. The manufactured consent is the economy is booming and the number of unemployed is at record lows. Here’s my unease with the unemployment success story. There isn’t a week I don’t meet jobless people who are seeking work yet receive no support from the state. Many friends and extended family are hardworking people who tell me they don’t register with Work and Income NZ because they claim they are hounded by officious bureaucrats and made to feel like something icky on the aforementioned’s shoe. The stories are too numerous to convince me there isn’t a calculated policy to make it humiliating for workers down on their luck to apply for assistance. Question 15: Why do big business and the government want to cut welfare spending? 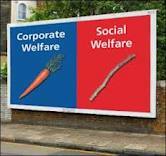 Big business wants to cut the costs of welfare for two reasons. Firstly, benefits above the barest minimum are seen as a barrier to lowering wages. The costs of welfare are also seen as a barrier to the government’s programme of cutting taxes on business and the rich. Cutting social welfare and cutting taxes for the rich usually go hand in hand. By targeting the most vulnerable the government hopes to get support for large scale cuts to basic welfare for everyone. They can then use those cuts to finance tax cuts for business and the rich. And they are happy to lie to achieve that goal. John Key claimed in February 2010 that the government would save $10 million over their lifetime if 100 sole parent beneficiaries were moved off benefits and into work. In March 2010 he upped the ante and claimed that getting 5 percent of DPB recipients (around 2150 sole parents) with a child over six off the benefit would save $200 million. This calculation assumed the full cost of DPB over another 6.5 years on the DPB. This number doesn’t actually match time usually spent on the DPB. What he also “forgot” is that nearly exactly the same amount would be spent or lost on Working For Families, In work Tax benefits, child care subsidies, payments from the other parent (which goes to the State) and the like if (as can be assumed) they work 20 or more hours a week. Working for Families alone would cost $170 million over the 6.5 years. That’s the way our benefit/wage/tax system is set up. The biggest disincentive to working is the 100% marginal tax rates for income earned by beneficiaries over $80 a week. The proposed increase in this level to $100 (for those on the DPB and invalids benefits only) will do very little remove the real disincentives that exist to working more hours while transitioning off a benefit. This $20 increase is the first increase in the limit in two decades! People on unemployment and sickness benefits will still only be able to earn $80 a week before their benefits are reduced by 70 cents for every dollar they earn. Promising to allow beneficiaries to earn up to $100 a week before their benefit is affected was one of the only good parts of National’s pre-election policy and they have reneged on it. 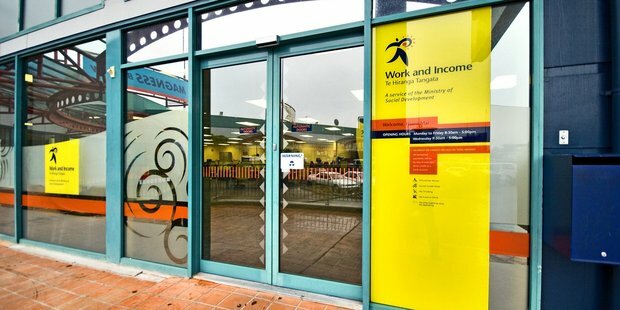 National’s 2008 Benefits Policy Backgrounder notes: “After paying tax on their extra income, and losing part of their benefit, beneficiaries can be in a position where they are losing up to 92 cents of every additional dollar they earn. This is a disincentive for people to work even a few hours a week.” The law change introduced by National will force sickness and unemployment beneficiaries to do exactly that. The intrusive and punitive work test regime will set up a costly new layer of bureaucracy to police those forced onto benefits by an economic system that has failed to create enough jobs. Solo mothers on the domestic purposes benefit will be expected to work a minimum 15 hours a week if their child is over the six. For some reason Widows are exempt from this requirement even if they have no dependent children – probably reflecting the governments elitist concept of deserving and undeserving poor. If you husband drops dead you are “deserving” and won’t be work tested. If you are abandoned by a violent husband, or get pregnant outside of a good middle class family – you are “undeserving”. Sickness beneficiaries will also be assessed for part-time work and required to seek work if deemed able to work at least 15 hours a week. The package also offers case managers a new range of penalties, including cutting payments by 50 percent and suspension of payments in full. The requirement that sickness beneficiaries must present medical certificates at four, eight, thirteen and 52 weeks to verify their condition will impose considerable extra costs on everyone now on a sickness benefit, mindful that a full examination with blood tests can easily cost nearly $100 a time. I’ve spent most of this week in bed sick, so had the rare opportunity to listen to hours of radio talkback while lying semi-comatose. Most of us live in an insular world of our own families, our work and our own interests. The news about other people is what we hear manufactured through our mass media in sometimes sensational soundbites. Rarely does it impact on our lives directly, so it’s relegated to background noise. Talkback land is different. Real people call with uncensored opinions. It can be rough and banal. Much of it is interesting. At times I felt like I was in a bar or a party somewhere. Most politicians, senior bureaucrats and business leaders have no idea how their bad decisions affect others. Mid-afternoon on RadioLive I caught up with Sam, a “first-time caller” from Kaikohe. Sam told us he’d smashed the windows of his local Work and Income office with a hammer after the staff refused to give him a food parcel. He has been trespassed from the Winz office. Sam is a 58-year-old invalid beneficiary. He was run over 20 years ago in a car accident. He lost an eye, an arm and a leg. Since then he’s spent his life in a wheelchair. He raised his daughter as a sole parent while working in his own takeaway business. He owns his home. Sam said he didn’t drink, take drugs or smoke. But after paying his fixed living costs, including his mortgage and insurances, there was virtually nothing left for food. A week ago he had no money for food or petrol. Previously, budgeters had told Sam to go to Winz as he didn’t have enough to live on. So he was forced into setting out on a 4km journey in his electric wheelchair. He took his bank account details and his budget to request an emergency food voucher. When he got there the first staffer wouldn’t even look at the figures and flatly turned him down. Another staffer agreed that no one could live on Sam’s budget but, as they had given him help twice before, and he wasn’t any different from anybody else, they weren’t allowed to help him. Sam left humiliated. 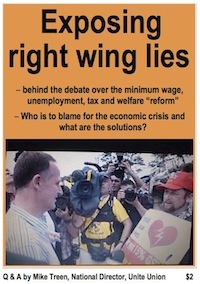 Only someone who has had the misfortune to rely on Winz can truly understand that. He took the trip home again and starved for several days. Then a light went off. He made a pact with himself that he wouldn’t eat again until he died or this Government changed its policies so no other person would have to go through what he has had to. To bring attention to his cause he wheeled back into town with a hammer. He smashed two windows of the Winz office before it opened. He hadn’t lost his temper. It was a political act. The radio host asked if he was sorry. It kind of missed the point. When Sam was asked if he had any empathy for the Winz staff, he wryly mentioned that they looked well-fed and comfortable. 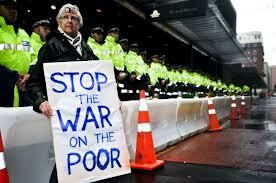 The Minister for Social Development, Paula Bennett, revels in her power over the poor. She preens when she’s criticised. When interviewed about Sam, the best she could come up with was that violence was not acceptable. Most politicians see what they do as a bit of a game. But political ideals can be the greatest calling where an individual is prepared to die to protect them. Sam Kuha has unintentionally taken the Gandhi path of the peaceful hunger strike. I don’t believe for a minute that Sam isn’t serious about taking his hunger strike to finality – it’s now almost two weeks old. The wife of the US president, Michelle Obama, said earlier this month that people like her (and Bennett) who through good fortune rose above their humble beginnings should always remember that they didn’t do it alone. They had an obligation to not raise the drawbridge behind them. How fitting that a starving invalid in a wheelchair is pitted against a well-coiffed, plump Cabinet minister. Who represents the real “bludgers”, as Bennett seems to think they are, in our society? Question 12: How did the government justify the 1991 benefit cuts? What did the government say about welfare recipients then? Beneficiaries were demonized to blame the victim not the system for rising unemployment and more people being forced onto some type of benefit to survive. 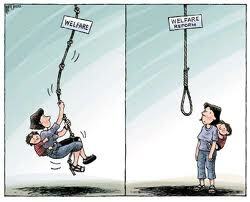 The very existence of the welfare state came under attack. In the 1990s the then National Social Welfare Minister and later Prime Minister Jenifer Shipley sought to justify benefit cuts by demonising the benefit recipient and blaming them for society’s social ills. In 1992 she wrote: “the welfare state itself through its mechanisms, produces young illiterates, juvenile delinquents, alcoholics, substance abusers, drug addicts, and rejected people at an accelerating speed.” She counterposed “rampant welfarism” to “individual initiative and effort.” In 1996 even the then head of the Social Welfare Department Margaret Bazley linked sole parenting to “at risk” children. 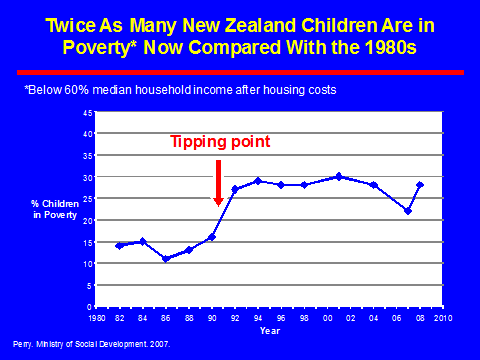 At the “Beyond Dependency” conference Blazey said 25 percent of children in New Zealand have no parent in paid work, with the figure for Maori children 48 percent and for Pacific Island children 45 percent. This she claimed is causing an intergenerational dependency problem, so now “we have got children whose only fantasy, whose only dream, is life on a benefit.” The focus, she said, had to be on “the people who have lost their living skills, they’re living in a chaotic state. They don’t go to bed at a decent time, they don’t get up in the morning, they don’t get their kids to school, they don’t feed them, they don’t give them lunch so those kids are doomed to that same lifestyle.” Bazely denied there was a problem of a lack of jobs. “I think the reason that they are not in jobs is not because the jobs aren’t there. It’s because other people are more attractive to employers.” A hint of what Bazley has in mind for beneficiaries was given by those she invited to speak at the conference, including Jean Rogers, representative of the US state of Wisconsin which cuts off benefits for mothers after 12 weeks – before they have finished breast-feeding! “Saunders, if I can put this succinctly, is a nut job. He writes fiction as well as right wing opinion pieces for the press in Australia and Britain, even though it can be hard to tell the difference. Let’s start with the opinion columns. In 1994, in his review of Charles Murray’s notorious book The Bell Curve on the alleged links between race and intelligence, Saunders concluded that social class, not race, was the real determinant of IQ: ‘Britain looks surprisingly like a society divided into classes on the basis of talent.[!] The pattern of social mobility is broadly consistent with what should happen in a perfectly open society with recruitment based solely on intelligence.’ The working class, in other words, are innately more stupid. No wonder more of them end up on welfare. Especially the sole parents. Question 10: What happened to beneficiaries and their levels of support in the 1990s? In 1991, National savagely cut the rates of all benefits, including the invalids and sickness benefits. The harshest cuts were for the unemployed. The unemployment benefit was cut by 25% for young people, 20% for young sickness beneficiaries, and 17% for solo parents. They abolished the family benefit and made many workers ineligible for the unemployment benefit with a stand down period of up to a six months. The 1992 benefit cuts were worth approximately $1.3 billion – about the same size of each of the tax cuts handed out in 1996 and 1998. Unemployment benefits were stopped for 16 and 17 year-olds and the youth rate for 18 & 19 year-olds extended to the age of 25. Benefits as a percentage of the average wage fell significantly after 1985.The single person unemployment benefit dropped from 42 to 30% of the average wage by 1996. 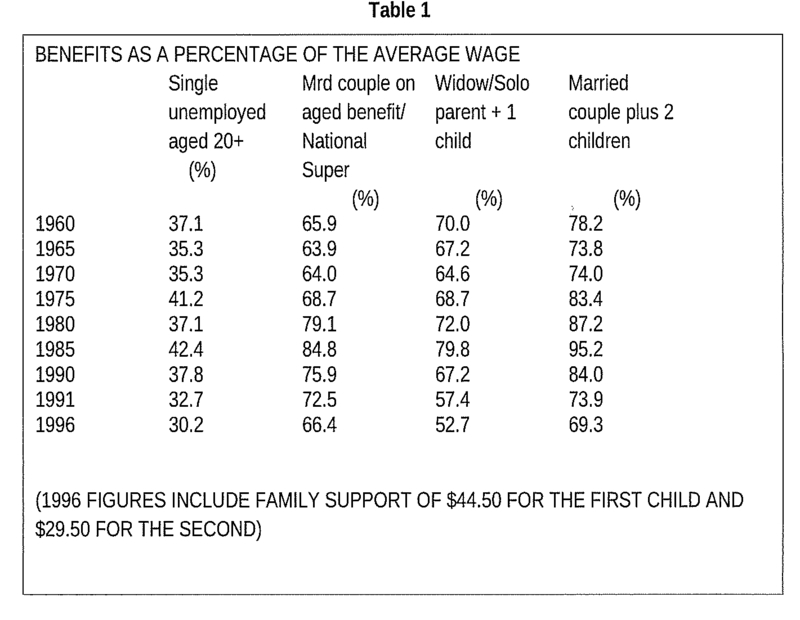 National Super for a married couple went from 85% to 72%. A domestic purposes benefit for a parent with one child went from 80% to 53%. The benefit for an unemployed couple with two children went from 95 to 69% of the average wage. The real value of National Superannuation was cut by 40% when combined with the extension of the age of eligibility from 60 to 65 years between 1992 and 2001 (See Table 1). Question 6: What sort of policies did the government adopt in the 1980s and 1990s and how did those policies affect working people? The economic and social policies adopted in the 80s and 90s included anti-union laws, benefits cuts, reduced access to education, health, housing and other social services and large scale unemployment and poverty. The promised surge in growth and incomes never followed. The deep attacks on our rights and living standards began under the Rogernomics policies of the Third Labour Government from 1984-1990 (named after the then Minister of Finance, now ACT MP, Roger Douglas). These were guided by rightwing economic theories that promoted so-called free markets and private property above all else. These are commonly referred to as “neoliberal” economic policies. 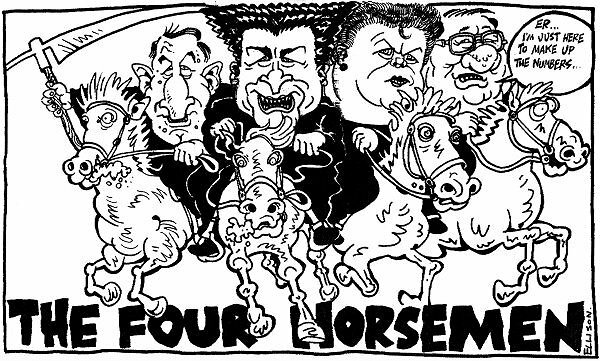 Financial markets were deregulated, domestic industry protections removed, $10 billion worth of public enterprises like Telecom and the BNZ privatized, progressive income taxes for higher income earners replaced by GST on consumption. Taxes on wealth and property were largely eliminated. All important state sector appointments went to people from the same right wing big business elite – whether in the Treasury or Social Welfare departments. State Owned Enterprises were made to mimic the profit first behavior of their private sector counterparts. The Reserve Bank was freed from democratic controls to impose crippling interest rates. The dollar was floated to allow big business to move their money where and when they liked. The New Zealand dollar became the victim of international speculators who sent it on a roller coaster ride in value as the world’s eleventh most traded currency. The Reserve Bank used high exchange rates to squeeze inflation, and squeezed the life out of agricultural and other exporters in the process. The Labour government effectively outlawed strikes outside of the contract negotiation period. The National government from 1990 to 1999 completed the job. They cut the value of benefits and tightened access rules. The Employment Contracts Act (ECA) launched a full scale attack on worker rights resulting in major losses of pay and conditions in subsequent years. Before the ECA, around 720,000 workers had protection under awards or collective agreements; by 1996 that number had dropped to 350,000. The ECA made multi-employer bargaining illegal and union recruitment very difficult. The deregulation fervor affected all areas of life. It was claimed it would improve “efficiency” and business was best left to decide its own rules. One result is the multi-billion dollar debt that home owners, councils and the government is landed with as a consequence of the “leaky homes” scandal. Enter your email address to receive notifications of by email. Unite members have access to exclusive benefits, including free and discounted services and great savings using their Unite membership card. Click on the image above to visit our Members Services website at www.uba.og.nz to register and find out why it pays to belong.